Most of the time, when it comes to creating new recipes - it's my family who chooses what to make (or whatever is currently in the fridge and pantry!). You see, my brain is so full of recipe ideas that when it comes time to making something, I never know what to make! I want to make cookies but I haven't made cheesecake in a really long time.. oh but chocolate cake is always a winner - wait, I have those new cupcake liners that would be perfect for cupcakes but hold on, what about cake pops or savoury recipes... I never do savoury recipes - but everyone loves breakfast don't they? My brain is a flurry of ideas and I'm terrible at making decisions. 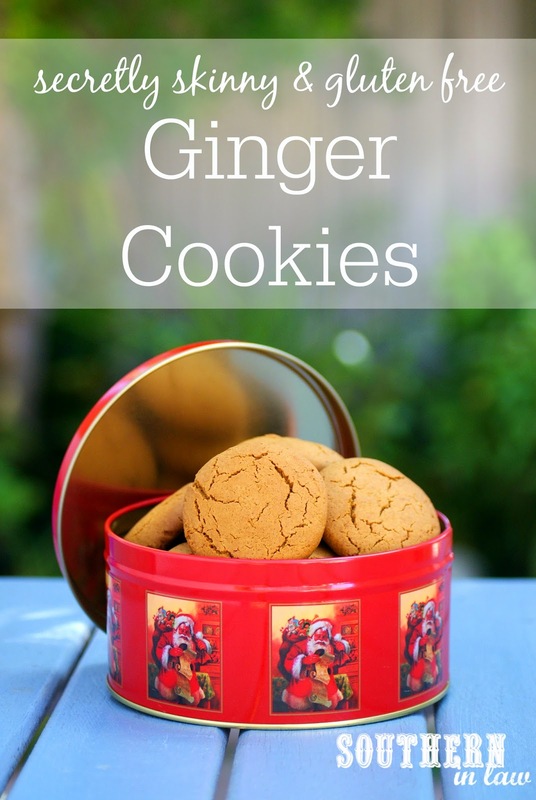 Recently we've been working on Christmas recipes and I was trying to figure out what I wanted to make next when my sister said; "Hey Kristy, that tin would be perfect for ginger cookies - those snowball cookies were awesome but can you make me some ginger cookies please?!" And ginger cookies it was! I set to work to create the perfect ginger cookies for my sister. They needed to be soft, yet have slightly crisp and crunchy edges, have a delicious ginger flavour that was perfectly balanced with cinnamon for that Christmas-y flavour, be easy to make and perfect for gifting - and I wanted the house to smell like Christmas once they hit the oven. In true SIL style, they also had to be gluten free and healthier too! 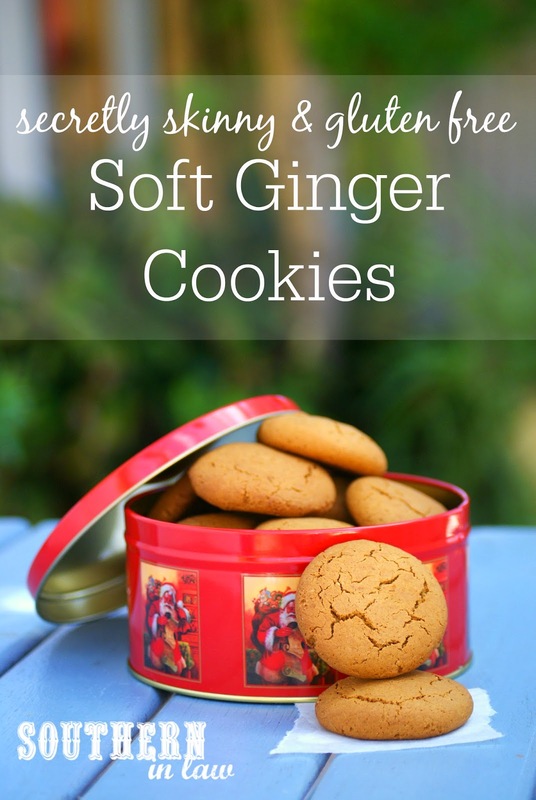 I managed to create exactly that and more and we've been obsessed with these Healthy Soft Ginger Cookies ever since! You really cannot tell they're lower in fat or sugar or gluten free because they are seriously, ridiculously good! Line 2-3 baking sheets with baking paper and set aside. Combine your sifted flours with your spices, baking soda and salt and set aside. Beat your butter and sugar in a mixer until light and fluffy, add in your molasses, vanilla, applesauce and egg and beat to combine (it may look curdled but don't worry, it will all come together with the flour!). Add in your flour, mixing until a soft dough forms and all of your ingredients are combined. Wrap your mixing bowl with cling wrap and chill your cookie dough in the fridge for 1/2 an hour to an hour until firmer. Once chilled, roll your cookies into balls and flatten slightly on your prepared baking trays, placing the cookies about half an inch apart. If you want to freeze your cookie dough to bake later: Simply freeze your formed cookies on baking paper until firm, then transfer to a ziplock bag and remove all of the air. You can keep them frozen in ziplock bags until you're ready to bake - then just take out as many cookies as you like, allow them to defrost slightly on a baking sheet lined with baking paper and bake for 12-15 minutes (depending on how defrosted your cookies are) or until lightly golden. Bake your cookies in your preheated oven for 10-15 minutes, or until lightly golden and your edges are just starting to crisp up. They will firm up as they cool, however, if you like crunchy cookies bake them a little bit longer! 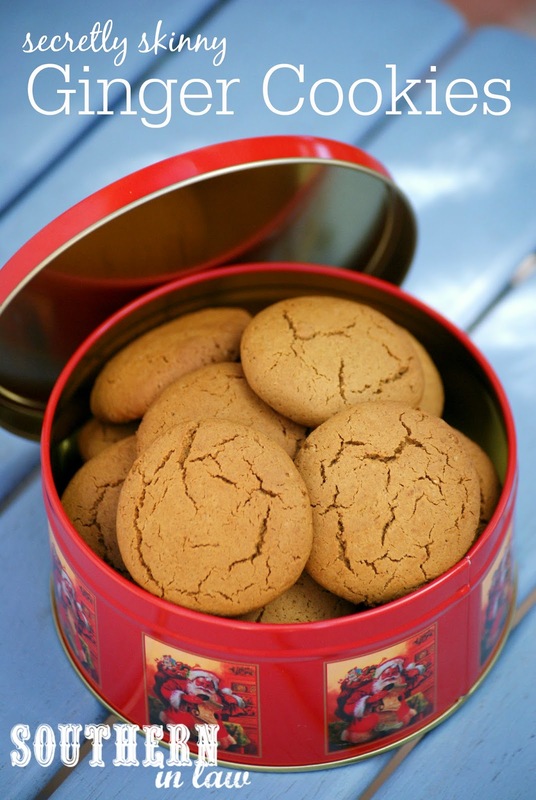 Leave to cool completely before storing in an airtight container or placing them in a jar/tin/cookie bag ready to gift! The cookies will keep for a week or so (the longest they've lasted for us!) at room temperature in an airtight container. 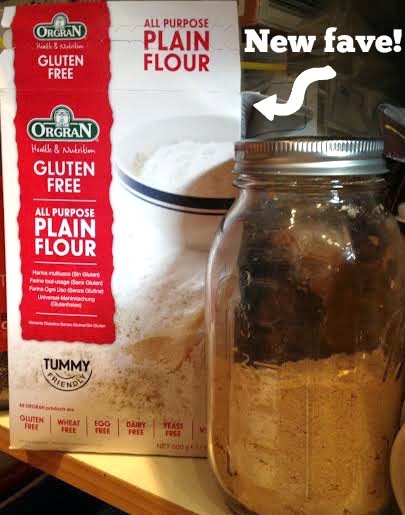 We've always used Orgran flours in our baked goods (as they're also soy free, yay!) but dare we say it, these new multigrain blends are even better - and available at Coles, Woolworths and IGA Stores! Or online at places like Catch of the Day and Grocery Run (sister companies) if you want to buy them in bulk! This recipe very quickly became a SIL Family Favourite - and hopefully it becomes a favourite in your home too! 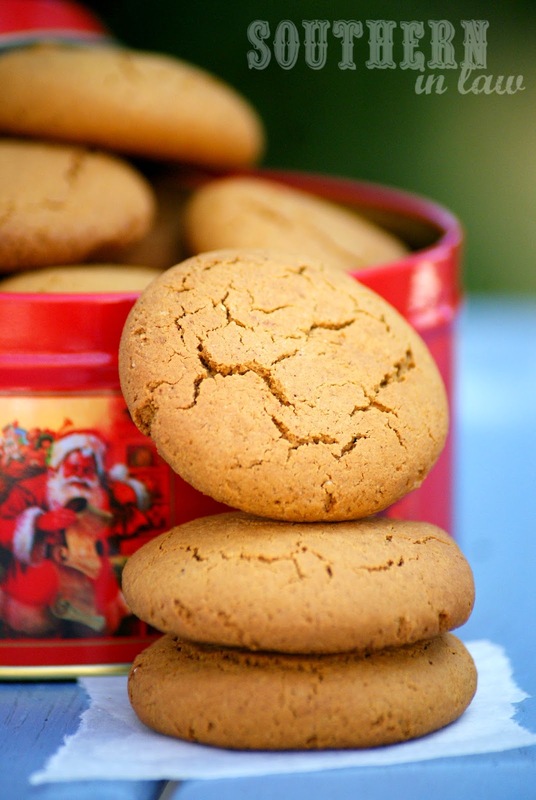 We're planning on baking up quite a few batches this Christmas to share with our loved ones! But tell me, what's your favourite kind of cookie? And do you have a Christmas/Holiday/Any kind of recipe you would like me to make healthier? Oh wow, your sister seemed to read my mind too! 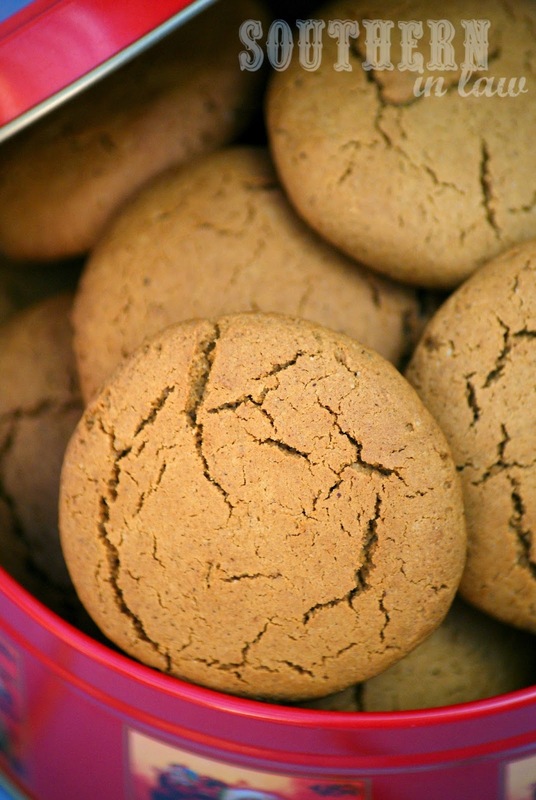 Ginger or gingerbread cookies are one of my favorites whether it's around the holidays or just anytime! Do you think I could use whole wheat flour in place of the rice flour for a similar taste? Liked on Facebook, and posted to your wall. I never know what to make either! I always ask my family what they want me to create....but they are no help either! I cannot wait to try the Ham & Cheese Savoury Crepes from the Hans Range. They look simply divine and seem so easy to make! Eggs and bananas for a quick and easy pancake for the kiddies as a treat. Eggs Ranchero is our "Treat dish", we would eat eggs most days. my little boy (5yrs) has just adopted chicks, they were hatched in his classroom and we get to take them home on friday. We are all very excited. We already had them last weekend and miss them, as a mammy I don't like looking at the empty 'nest" ..roll on friday. Cant wait to be cooking with our own eggs, in about 6 months!!! Dippy eggs with avocado on the soldiers is my absolute favourite meal. I have it every single day. Plain Poached Egg with chicken salt, ironic but nice. Your home made ham & cheese Crepes will do me - AND I have a Crepe Maker in the cupboard already! To have my eggs made by my husband whom we call 'Eggboy". He just loves eggs!! We are his little "yolks" and he makes a "cracking" omelette!! Frittata made with veggies harvested fresh from my garden and beautiful wholesome eggs. The last one I made had roast beetroot, carrot, pumpkin and spring onion. Delicious! If you ever have a left over pasta like Spaghetti or Penne bolognaise, mix an egg through it and place in a greased baking dish and cook in the oven until the top is crunchy. Makes for a great meal or lunch later on in the week and the egg adds a beautiful flavor and texture as well and combines the pasta holding it all together when cut. Like a Pasta Pie without the fatty pastry! Nothing beats yard eggs! Your entry is in our system, good luck! Simple but delicious, Brooke! Your entry is in our system, good luck! Sounds amazing! Your entry is in our system, good luck! Yum! Your entry is in our system, good luck! That sounds like the perfect treat dish! Your entry is in our system, good luck! Simple but delicious, Marnie! Your entry is in our system, good luck! Sounds intriguing, Brianna! Your entry is in our system, good luck! Simple is always a winner! Your entry is in our system, good luck! Mm, yum! Your entry is in our system, good luck! Too cute - I think Eggboy would definitely love this prize! Your entry is in our system, good luck! What an incredible frittata - sounds amazing! Your entry is in our system, good luck! Definitely a great way to use leftovers! Your entry is in our system, good luck! Sounds perfect, Mary! Your entry is in our system, good luck! Now that sounds delicious, Brooke! Your entry is in our system, good luck! Sounds delicious, Emma! Sandwiches can definitely pass as breakfast though :P Your entry is in our system, good luck! They're simple and delicious, Marie! Your entry is in our system, good luck! What a perfect recipe to try then! Your entry is in our system, good luck! They're delicious, Kaye! Your entry is in our system, good luck! Fetta cheese, ham, tiny bit of basil pesto and a touch of soft egg chepe. the Pita Bread and blended Roasted Capsicum Sauce base, will be on my fingertips soon…! Sounds delicious, Scott! Your entry is in our system, good luck! Ham & cheese crepes yum! Now you've got me craving ham! I will be trying out your crepe recipe this weekend. Thanks! Yum, those crepes look great! I'd love to try a classic ham and salad sandwich with freshly home-baked bread using Oliving by Hans range. Simple but delicious! Eggs cooked any way you like. They are the perfect food and you can't improve on perfection. I absolutely love Dukkah baked eggs with toast soldiers .. yummy and healthy. !!! Every one loves egg cups! Every morning for the last 6 years I have had an egg cup for breakfast. Egg-Tastic egg cups for young and old. Any meal is an "eggscellent" meal when it's cooked by someone else, especially breakfast egg muffins. I make a meal eggscellent by adding eggs - it's just that simple! Eggscellent is a runny egg with crisp toast. Purely and simple - hard boiled egg with a bit of salt. My favorite midnight snack. Why ruin perfection? I love omelettes they are so versatile and quick and easy for dinner if you have hard a hard day! omelettes are full of goodness, filled with egg, milk, a bit of salt and pepper and special ingredients to make it superb! Can't beat Nigella's creamy eggs. An egg in a ramekin with a few tablespoons of cream, some salt and pepper, baked until the whites are just set up. Even my 3yr old will eat that! One of my favorite breakfasts is salsa and eggs. I cook an egg over hard and smother it in salsa verde while it is cooking. Yummy! My favourite way to eat eggs is poached on toasted rye with avacado, grated zuchini and carrot , topped with some rocket . I love using eggs for a zucchini and tomato crustless quiche which can be eaten hot or cold. I think there is nothing nicer than a Cheese, Bacon and Mushroom Omelette, for breakfast, lunch or dinner. Sundays, portobello mushrooms on Webber Q kinda stuffed with, butter, bacon bits and egg, swear to good this is the BEST way to have 'egg rooms'. Eggs and me really do agree. I love them anyway and everyday. Mmmm I can only imagine what luxury cooking with the best modern machinery. BREVILLE, CARRARINI and MAXWELL WILLIAMS too, truly eggscellent!! nothing beats a soft poached egg over bacon, onions, garlic, chilli, mushrooms and sour dough toast, divine when you cut into the yolk and it drizzles everywhere. I was a happy, confident youth but I had seen so many bad relationships. My father remarried when I was in my teens and though his relationship with my new step-mother quickly went south her family welcomed us kids with open arms. By the time I turned 16 my new Uncle was trying to set me up with his electrical apprentice (21). A close friend of the family, they had known him since he was 5 and he was my Aunts pride and joy. For five years my new family pressed and teased. His name was permanently etched in my sub-conscious. We were both shy though and had never actually met face to face. Then, when I turned 21 he came over to me at a get-together and introduced himself. My very first words (and he's never let me forget this) were, "Oh your Quentin!" Not very smooth, but then I asked if he'd like to sit and we talked. He asked me to dance and I made him wait for the tunnel dance because, I thought, it was noncommittal. That's where we left it for one year. But I started looking for him at family gatherings. Asking mutual friends what kind of person he was. You know, "Creeping". The next year we both happened to be at my Uncle and Aunts on the same night a bunch were going for wings and he asked me to come along. And so it officially began. He was the first person I had ever dated and I was the first for him. We dated for 6 months. He came to our house every other weekend and i met him at my uncles the weekends in between. When we got engaged he bought me a cell phone so we could talk anytime and 6 months after that we had a beautiful December wedding. I was 23 and he had turned 29 that month. My health has never been very good, but in the last few years i have been critical several times. Through it all he has stuck by me. Caring not only for me but our beautiful daughter as well. He is guardian now to my special needs brother. And my special needs sister adores him. I don't know how he handles it all but he is my other half, the love of my life. And through it all he's made me feel like I'm the one that we couldn't do without. I'm so happy you too found the right one. Thank you so much for sharing your story! Isn't it funny how things work out in life! Anyway, I remember all the flights to see one another. So great, yet so heart-wrenchingly painful when they were over. Even thinking about watching him go through airport security still makes my eyes water, and we've been living together for two years now. I'm glad it all worked out for you guys! You never know how you're going to meet someone! Oh, also, I was 15 and he was 18 when we met. Our stories are quite similar, ha! I think any distance in a relationship is tough - whether you're 100 miles or 10,000! Louisiana can definitely be a fun place - but like anywhere there are some bits that are VERRRRRRRRRRRRY boring - and Jesse's hometown happens to be one of those places haha. This is such a sweet story! Considering the dedication you both had to making it work I think anyone criticising you has no idea what they are talking about.